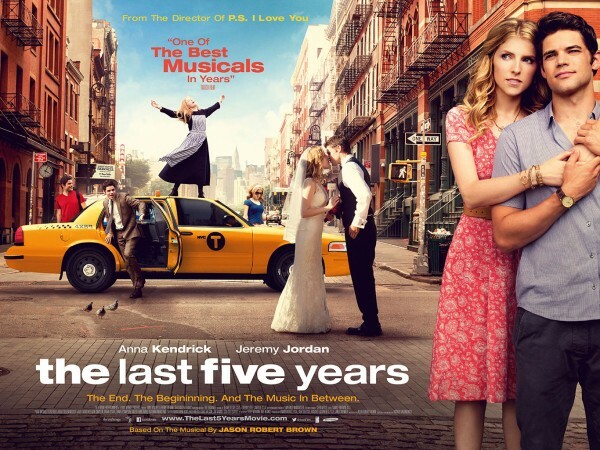 The Last Five Years is a film musical based on an off-Broadway 2002 stage musical by Jason Robert Brown (which I hadn’t seen nor heard of until now) and directed by Richard LaGravenese (whom I only know for his screenplay for Behind the Candelabra, the Liberace biopic.) It is a musical melodrama rather than a musical comedy, largely a two-hander, about the rise and fall of a love affair and marriage. It’s the story of a young couple who fall madly in love only to be pushed apart by the complications of life and their relative success and failure in their respective careers. Cathy (Anna Kendrick) plays the small town girl trying to make it in the city as an actor and singer. She meets Jamie (Jeremy Jordan), an ambitious young writer (the “new Jonathan Frantzen” according to his agent) searching for a publishing deal. As Jamie’s new novel projects him to the top of the literary scene, Cathy is still doing summer stock musical theatre in Ohio, and their diverging levels of success pose pressing and dire challenges to their relationship. In a way the film reminded me of the various versions of A Star Is Born in that one of a couple feels the pain of their partner’s success. But whereas A Star Is Born involves the formerly successful partner declining while the other one rises from obscurity, Cathy in The Last Five Years never actually makes it and Jamie’s success combined with Cathy’s failure poisons the relationship. The film is structured around sixteen scenes, each based on a song, eight for Cathy, seven for Jamie and only one where they sing together in the same scene. This occurs at the halfway point where they are in Central Park and Jamie proposes to Cathy and then the scene segues to their wedding in the same location. They sing first of all separately and then in a duet, the only one in the film. The fact that they don’t sing together, with the exception of this scene, derives from the original stage musical where the two characters sing on the stage alone in alternate scenes, appearing together only in the Central Park scene. I don’t know how effective this was in the stage musical but in the transition to film it could have been problematic. As one of the couple sings, the other stays mostly silent, reacting with looks, gestures, occasional grunts and minimal verbal responses. Sometimes the problem is dealt with one of the couple speaking to the other on the telephone and we infer the other’s responses. And in one scene, the action is conveyed by a Skype conversation. It could have resulted in mannered, one-sided interactions between the characters, but overall, I found this stylistic trope strangely beguiling in the way that it embodies visually the couple growing apart. After this scene I expected film would flashback to the beginning of their relationship which indeed it does with Jamie’s song, “Shiksa Goddess” but rather than continue the narrative chronologically, we cut to the penultimate scene (in terms of the story’s chronology) – “See I’m Smiling” – which marks the beginning of the end of their relationship five years later. It then reverts to Jamie’s song, ‘Moving Too Fast’, showing the relationship developing in its early stages. What becomes clear is that all of Cathy’s songs begin at the end of their marriage and move backwards to the beginning of their relationship while Jamie’s songs start at the beginning of their affair and move forward to the end of their marriage. This can be a little confusing at first but you soon grasp that it ‘s neither in chronological order nor a simple flashback. Of course this (double) departure from conventional narrative structure can be seen as gimmicky but, on balance, I found it an effective way the portray the couple drifting apart. It is a musical as well as a drama and so performance is of paramount importance in both fields. Producers of musicals have the problem of actors who can’t sing (the film has fun at the expense of producers of musicals when Cathy expresses her frustration at a casting session of not being paid enough attention with the lines, “Why am I working so hard, these are the people who cast Russell Crowe in a musical. Christ!”) and singers who can’t act. Classic Hollywood film musicals used to solve the singing problem by providing – uncredited – dubbing for the voices of well-known actors; for example, Marnie Nixon is only recently getting the credit for her work as the voice of Deborah Kerr in The King and I, Natalie Wood in West Side Story and Audrey Hepburn in My Fair Lady. But in The Last Five Years the performers cope more than adequately (Jeremy Jordan) and much better than that (Anna Kendrick). With the exception of Into the Woods, I wasn’t too aware of Anna Kendrick as I’m not exactly the demographic for the Twilight films where she got her break as the friend of the character played by Kristen Stewart (whom I wasn’t aware of until Still Alice). An interview in the Guardian last Friday reminded me that I must have seen her with George Clooney in Up In The Air but I don’t remember her. But in this film I found both her acting and singing to be excellent. She handles the fundamentals of dramatic singing — like phrasing and placing enunciation in the right places — so well. And her acting expresses very effectively the extremes of emotion Cathy is subject to. It helps that Cathy gets the best songs and her characterisation is more nuanced than Jamie’s. Both characters get a comedy number. Jamie’s ‘The Schmuel Song‘ – which I don’t think really worked – is a story about a tailor who achieves his dreams and, apart from cheering Cathy up after another rejection, contains a kind of ‘follow your dreams’ message. Much good it did her. Cathy’s comic song, ‘A Summer in Ohio’, relates to Jamie (by Skype) just how miserable she is while doing summer in Ohio as Jamie remains in New York. She cheerfully belts out lyrics like, “I could wander Paris after dark / Take a carriage ride through Central Park / But it wouldn’t be as nice as a summer in Ohio / Where I’m sharing a room with a former stripper and her snake, Wayne”. Brown’s score is an eclectic mixture of musical styles drawing on a number of genres – jazz, rock, pop, Yiddish folk, ‘Sondheimian’. The songs are occasionally soulful. The best song, the break-up song that the film opens with, is quite poignant. The problem is that the subsequent songs don’t match up to this. Only a few of the songs stand out musically as opposed to being acceptable vehicles for developing the drama (though certainly no less than the much vaunted Wicked which I saw last week). This is a pity given the talent available. Another problem for me is that, apart from a few words of spoken dialogue, it’s a sung-through musical (i.e. virtually all the dialogue sung – cf Les Misérables, Eva, Miss Saigon) and often this leads to a kind of relentlessness, depriving the audience of breathing space. One way of avoiding this is to create a soundtrack where big numbers alternate with a sort of melodic recitative with recurring musical motifs but this is not – with the exception of a section in the I’m Still Smiling scene – the approach of The Last Five Years, which is simply a sequence of songs that lack organic unity. It seems to have been such a minimal theatrical release that it is more like an advertising campaign for its VOD release (which is where I found the film). The interview in the Guardian with Anna Kendrick I referred to above didn’t even mention the film. This is a pity as, despite the caveats I have expressed, I found the film engaging and enjoyable. Here is the UK trailer.